Designed for defense and aerospace applications, Liquid Flow-Through (LFT) Electronics Chassis incorporates coolant, control system, smart pump, filter, accumulator, heaters for cold-system startup, and 3 different board-level heat-absorbing technologies. It is capable of cooling up to maximum of 850 W/slot, total of 2,000 W with dielectric fluids such as hydrofluoroethers and synthetic oil, or 4,000 W with non-dielectric fluids like water or water/glycol mixtures. LONG BEACH, Calif., May 16, 2006 - Parker Hannifin today announced that it has designed and built an advanced standards-based technology liquid cooling demonstrator for high-power embedded electronics applications to support manufacturers and users of open-system architectures. It was unveiled at the "MEECC(TM) (Military Embedded Electronics and Computing Conference) - 2006," held in Long Beach, May 16 and 17. Designed with the defense and aerospace communities in mind, the product being demonstrated is called a liquid flow-through (LFT) electronics chassis. The packaging for the LFT demonstrator chassis is an air transport rack (1-ATR long) standard-sized enclosure of approximately 8"h x 10"w x 20"l. The system is entirely self-contained, with its own closed-loop liquid cooling system. The system contains coolant, a control system, smart pump, filter, accumulator, heaters (for cold-system startup), and three different board-level heat-absorbing technologies to demonstrate the variety of options available to the electronics designer. Parker's LFT chassis is capable of cooling up to a maximum of 850 watts per slot, a total of 2,000 watts with dielectric fluids such as hydrofluoroethers (HFE) and synthetic oil (PAO), or 4,000 watts with non-dielectric fluids such as water or water/glycol mixtures. The product can be scaled to accommodate the required amount of technology integration for individual applications, and is hybrid-backplane capable to accommodate any board technology, including VME, VITA 41/VXS, and VITA 46-48/VPX (REDI). It is designed to be two-level maintenance compatible. The user can easily change out both the major components of the cooling system and electronic modules in the chassis without the need for special conditions, tools, or specialized technical knowledge. In all configurations, the cooling system is dry to the user, who never sees the coolant. Depending on the board-level cooling method, the electronic components may or may not be wetted by the cooling fluid as required or desired by the user. A modular design approach allows this advanced development chassis to be used through several tech-refresh cycles, thus considerably lowering the system's total cost of ownership. The product is designed for military implementation with shock, vibration, and acceleration to MIL-STD-810F. It has EMI/EMC to MIL-STD-461E and operation from -40 to 85 degrees C.
Storage temperatures are from -40 to 125 degrees C. It can operate from -1,500 to 70,000 feet altitude and meets the humidity, salt fog, fungal growth, thermal shock, sand, and dust requirements of VITA 47. According to Jeff O'Reilly, business development manager, Parker advanced cooling systems, the LFT chassis "is a major technology innovation developed as a joint effort of a number of Parker divisions, with each designing a key component of the system. Parker's LFT technology is a uniquely packaged liquid cooling solution for high-speed airborne or ground-based signal processing applications such as radar, SIGINT, and electronics warfare. Parker's LFT chassis provides a rugged and stable environment for use with a new generation of high-performance boards. The demonstrator will offer a first-hand look at this exciting technology." For more information about the Parker LFT chassis, please contact Parker advanced cooling systems customer service toll-free in the U.S. at 877-912-COOL (912-2665), International +1 440-954-8100, or visit www.parker.com/advancedcooling. Parker Hannifin's advanced cooling systems business has developed a variety of fluid cooling solutions for military and commercial electronics applications that enable system integrators to achieve high compute and bandwidth density in the smallest volume possible. Parker is a member of the VITA Standards Organization (VSO), as well as the draft standard's development working group for VITA 48 "Enhanced Ruggedized Design Implementation" (ERDI), and chairs VITA 50 "Liquid Cooling - Best Practices." With annual sales exceeding $8 billion, Parker Hannifin is the world's leading diversified manufacturer of motion and control technologies and systems, providing precision-engineered solutions for a wide variety of commercial, mobile, industrial and aerospace markets. The company employs more than 55,000 people in 46 countries around the world. 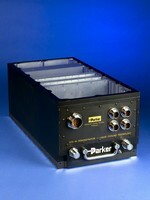 For more information, visit the company's website at www.parker.com.